The Rebirth of Pencil & Paper Systems! - The latest addition to the Strictly Mathematics Web Site: - StrictlyMathematics.com - Strictly Mathematics - Knowing is Winning! The Number Combination Slasher 3 and 4! A Pi formula for Pick 3 that actually works? The Rebirth of PENCIL & PAPER Systems! Talk to current members of the LOTTERY SECRETS GROUP and the PICK34 SPECIAL USERS GROUP and the users of the Services and Software from the PICK34.COM WEB SITES. What you will often hear is that the like the systems because they have influence in these systems. We listen, communicate and integrate ideas from the players on a continuous basis. When you are using one of the systems you are not alone. You have a forum to communicate with others, you can email anytime you want for help, suggestions, hints and you can call anytime of the day really for a hands-on walk-through or for samples. There are many systems available for every budget and for every type of player. Now one of the most recent suggestions from current users was to offer PENCIL & PAPER systems. Apparently there are times when you do not have the opportunity to use a computer and you still want to enjoy your favorite pastime: selecting lottery numbers. The requests we received from Ken and others made us set up a new area on the STRICTLY MATHEMATICS WEB SITE: PENCIL & PAPER. It is still a fairly small area (you have to start somewhere) but it is new. The idea was intriguing. But just writing some instructions on how to manipulate numbers to come up with new ones? That's how pencil & paper was done in the past. We wanted to go a step further. The PENCIL AND PAPER systems on the web site should just require to print the page out and allow the player to do the necessary calculations right on that paper. Instead of vague instructions a clear system ready to be used with a form ready be to filled out. This is what you will find in the PENCIL & PAPER area on the Strictly Mathematics web site now: Ready-to-use systems that do not require a computer. And these systems are absolutely FREE: Free to print, free to use and free to share. As long as the pages are not changed they can be copied, shared at no cost. There is a donation option on the page. After all we do this for free and want to add more systems in the future if the current ones are liked. Suggestions are welcome too. If you have a good-working system let us know. A very simple system that uses the most recent 3 draws to create new playing numbers for the upcoming draws; almost like tic-tac-toe. AL Roberson's “Classic” 666 rundown that is also available as a computer-based system. 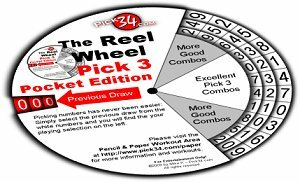 It was first introduced in the Pick3/Pick4 Treasures Workout Selection. The Pick 4 version of the 666 rundown mentioned above. It is also part of the Pick3/Pick4 Treasures Workout Selection. 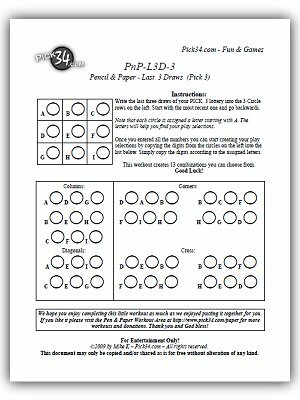 Easy-to-use system that combines the most recent drawn numbers with the not-drawn numbers to create a very successful play selection wheel. Same as the one before but especially designed for Pick 4 lotteries. This SCISSORS & PAPER system is the latest in the selection and it took a little time to design. It is a selection machine consisting of 3 Number Wheels and Selection Cover. You cut out the pieces on card-stock or photo paper and connect when with a metal brad or something similar. Entering the most recent draw provides you with 5 or 11 good numbers to play for the upcoming drawings. The numbers are good for up to 10 or more drawings. So CLICK HERE to check out the new PENCIL AND PAPER area and tell us what you think about it. Comments and suggestions are always welcome. © 2007-2009, StrictlyMathematics.com. All rights reserved. Designed, developed and hosted by tenesyNET.